An artist's concept of the sun's Great Conveyor Belt. A new study reports that the top of thegigantic conveyor belt of plasma moving inside the sun has been running atrecord-high speeds for the past five years. The phenomenon might be the reason why thesun has continued to have so few sunspots recently when it should be ramping upthe production of these surface-blotching storms.? "Ibelieve this could explain the unusually deep solar minimum we've beenexperiencing," said David Hathaway, a solar physicist at NASA andco-author of a new study describing the findings, in a NASA statement. "The high speed of theconveyor belt challenges existing models of the solar cycle and it has forcedus back to the drawing board for new ideas." The so-called Great Conveyor Belt is amassive circulating current of hot plasma within the sun. It has two branches,north and south, each taking about 40 years to complete one circuit.Researchers believe the turning of the belt controls the sunspot cycle. Hathaway has been monitoring the conveyorbelt using data from the Solar andHeliospheric Observatory (SOHO). The top of the belt skims the surface ofthe sun, sweeping up knots of solar magnetism and carrying them toward thepoles. SOHO is able to track those knots — Hathawaycalled them "magnetic elements" — and thus reveal the speed of theunderlying flow. "It's a little like measuring the speedof a river on Earth by clocking the leaves and twigs floating downstream,"Hathaway explained. SOHO's dataset extends all the way back to1996 and spans a complete solar cycle. Last year, Lisa Rightmire, a student ofHathaway from the University of Memphis, spent the entire summer measuringmagnetic elements. When she plotted their speeds versus time, she noticed howfast the conveyor belt has been going. A note about "fast": The GreatConveyor Belt is one of the biggest things in the whole solar system and byhuman standards it moves with massive slowness. "Fast" in thiscontext means 20 to 30 miles per hour. A good bicyclist could easily keep up. The speed-up was surprising on two levels. First, it coincided with the deepest solarminimum in nearly 100 years, contradicting models that say a fast-moving beltshould boost sunspot production. 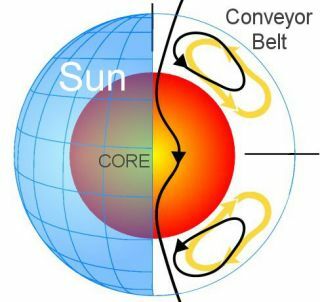 The basic idea is that the belt sweeps upmagnetic fields from the sun's surface and drags them down to the sun's innerdynamo. There the fields are amplified to form the underpinnings of newsunspots. A fast-moving belt should accelerate this process. So where have all the sunspots been? Thesolar minimum of 2008-2009 was unusually deep and now the sun appears to be onthe verge of a weak solar cycle. Instead of boosting sunspots, Hathawaybelieves that a fast-moving Conveyor Belt can instead suppress them "bycounteracting magnetic diffusion at the sun's equator." The second surprise has to do with the bottomof the Conveyor Belt. SOHO can only clock the motions of thevisible top layer. The bottom is hidden by about 200,000 kilometers ofoverlying plasma. Nevertheless, an estimate of its speed can be made bytracking sunspots. "Sunspotsare supposedly rooted to the bottom of the belt," said Hathaway. "Sothe motion of sunspots tells us how fast the belt is moving down there." He's done that — plotted sunspot speeds versustime since 1996 — and the results don't make sense. "While the top of theconveyor belt has been moving at record-high speed, the bottom seems to bemoving at record-low speed. Another contradiction." Could it be that sunspots are notrooted to the bottom of the Conveyor Belt, after all? "That's onepossibility" he noted. "Sunspots could be moving because of dynamowaves or some other phenomenon not directly linked to the belt." What researchers really need is a good lookdeep inside the sun. NASA's Solar Dynamics Observatory, launched in February2010, will provide that when its instruments come online later this year. SDO is able to map the sun's interior using atechnique called helioseismology. SOHO can do the same thing, but not wellenough to trace the Great Conveyor Belt all the way around. SDO's advancedsensors might reveal the complete circuit, which "could be the missingpiece we need to forecast the whole solar cycle," said Hathaway. The research was published in today's issueof Science.